Severe weather rarely happens without any warning. While we will never be able to pinpoint when and where severe weather will develop, we can identify broader areas with the potential for the development of severe weather. It is your responsibility to check the weather forecast, which may be often several times daily, to see if you are, or will be, under a risk of severe weather. The weather office charged with monitoring and forecasting the potential for severe weather over the 48 continental United States is the Storm Prediction Center (SPC) located in Norman, OK. Use the information provided by SPC to give you early critical information concerning the threat of severe weather in your locale. A sample Day 1 convective outlook. Convective Outlooks consist of a narrative and a graphic depicting severe thunderstorm threats across the continental United States. The outlook narratives are written in technical language, intended for sophisticated weather users, and provide the meteorological reasoning for the risk areas. This product also provides explicit information regarding the timing, the greatest severe weather threat and the expected severity of the event. The graphics that accompany the narratives provide vital information to help plan your day. Day 2 continues from the ending of Day 1 (tomorrow morning) for the next 24 hours. These are issued twice daily; 07z (around midnight) and 1730z (around noon). This is the forecast for the subsequent 24 hours. Day 3 forecasts are issued daily by 0830z on standard time and 0730z on daylight time (after midnight). A severe weather area depicted in the days four through eight period. It is issued at 10z daily (early morning) and indicates a 15% or 30% or higher probability for severe thunderstorms (e.g. a 15% or 30% chance that a severe thunderstorm will occur within 25 miles of any point). Following are the meanings of the colors used in convective outlooks. The light green shading depicts a 10% or higher probability of non-severe or near severe thunderstorms during the valid period. However, just remember that a thunderstorm producing ¾" hail and wind gusts to 55 mph wind is officially a NON-severe storm but can still produce damage. So, just because you may be in an area of "general thunderstorms", you need to keep alert for the possibility of rapidly changing weather conditions. probability for severe hail (≥1" / ≥2.4cm) OR severe wind. (≥58 mph / ≥93 km/h). wind gusts 75 mph (120 km/h) or greater . 45% probability of severe hail or wind. 60% severe hail probability WITH OR WITHOUT 10% or greater probability of hail 2" (4.8 cm) or greater in diameter. 60% severe wind probability AND a 10% or greater probability of a wind gust 75 mph (120 km/h) or greater. These are the official definitions. The reason for the "AND's", "OR's" and "WITH OR WITHOUT's" is the atmosphere is complicated with many different conditions that can occur. For example, there will be times when the number of severe weather events will be high but the overall intensities will not necessarily be extreme. Conversely, there may only be one or two severe events expected but the intensity of the event(s) will be extremely high. Therefore, below is a simplified version of the official definitions. Still Confused?!? Just know that the greater the threat (from Slight to High), the greater the risk for severe weather which could be either in number of events or intensity or both. The Public Severe Weather Outlooks (PWO) are issued when a potentially significant or widespread tornado outbreak is expected. This plain-language forecast is typically issued 12-24 hours prior to the event and is used to alert National Weather Service field offices and other weather customers concerned with public safety of a rare, dangerous situation. The Public Severe Weather Outlook is reserved for for all high risks and for moderate risks with a strong risk for tornadoes and/or widespread damaging winds. The SPC issues about 30 PWOs each year. A sample Mesoscale Discussion graphic. When conditions appear favorable for severe storm development, SPC issues a Mesoscale Discussion (MCD), normally 1 to 3 hours before issuing a weather watch. SPC also puts out MCDs for mesoscale aspects of hazardous winter weather events including heavy snow, blizzards and freezing rain. MCDs are also issued on occasion for heavy rainfall or convective trends. The MCD basically describes what is currently happening, what is expected in the next few hours, the meteorological reasoning for the forecast, and when/where SPC plans to issue the watch (if dealing with severe thunderstorm potential). Severe thunderstorm MCDs provide you with extra lead time on the severe weather development. A sample Convective Watch graphic. 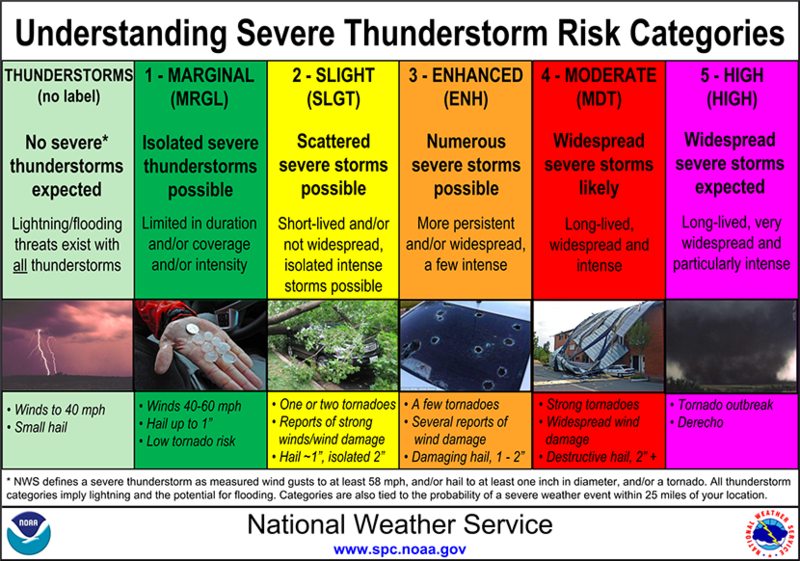 When conditions become favorable for severe thunderstorms and tornadoes to develop, SPC usually issues a severe thunderstorm or tornado watch. Tornadoes can occur in either type of watch, but tornado watches are issued when conditions are especially favorable for tornadoes. 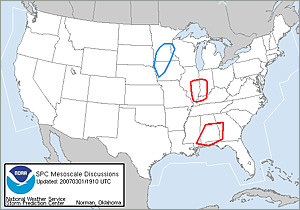 Severe thunderstorm watches are blue with tornado watches in red. Watches are large areas, 20,000 to 40,000 square miles, and are issued by county. They are numbered sequentially (the count is reset at the beginning of each year). A typical watch has a duration of about four to six hours but it may be canceled, replaced, or re-issued as required. A watch is NOT a warning, and should not be interpreted as a guarantee that there will be severe weather! When a watch is issued, stay alert for changing weather conditions and possible warnings. Any warnings will be issued by your local NWS Weather Forecast Office. When a severe weather watch is issued close to your location but does not include your county, you should still remain alert. The atmosphere rarely follows straight lines, and thunderstorms do not always remain within the man-made boundaries we create around them. When SPC feels confident about the possibility of severe weather in a specific area, they try to issue a watch at least one hour prior the onset of severe weather. In some instances the phrase "THIS IS A PARTICULARLY DANGEROUS SITUATION" will headline a watch (called a PDS watch). The "particularly dangerous situation" wording is used in rare situations when long-lived, strong and violent tornadoes are possible. PDS watches are issued when, in the opinion of the forecaster, the likelihood of significant events is boosted by very volatile atmospheric conditions.Usually this decision is based on a number of atmospheric clues and parameters, so the decision to issue a PDS watch is subjective. There are no hard threshold or criteria. 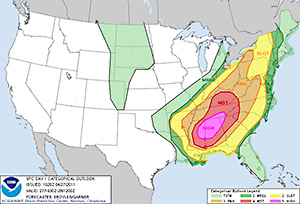 PDS watches are most often issued in association with "high risk" convective outlooks.